Gastroenterologists agree that removing a colorectal polyp is an important step in preventing colon cancer, but one challenge has been excising polyps that are large, particularly those that are flat and more than an inch in diameter. A recently introduced minimally-invasive approach, called endoscopic mucosal resection, or EMR, facilitates the removal of large polyps without the need for surgery. “It’s highly effective in 98 percent of cases, but a limitation to EMR has been the issue of follow-up after the procedure,” says gastroenterologist Michael Wallace, M.D., on Mayo Clinic’s campus in Florida. 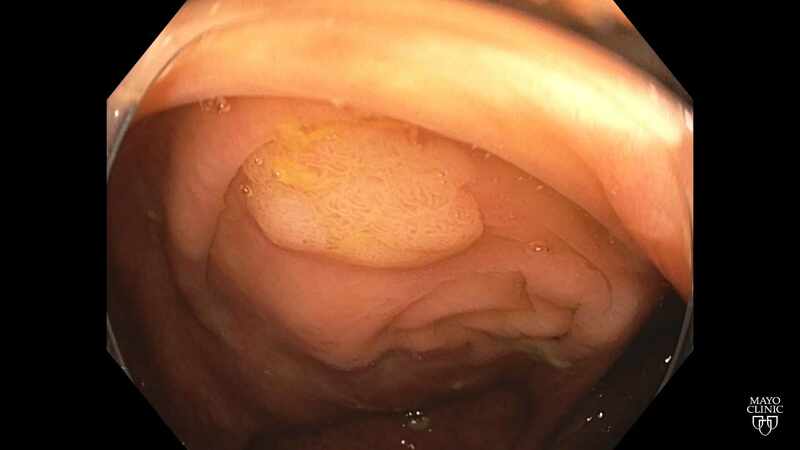 Traditional testing after EMR has involved a biopsy or additional tissue removal six months later to affirm there’s no recurrence of the polyp at the same site. In a study published in Gut, Dr. Wallace’s research team found that very effective follow-up to EMR can take place using an endoscope equipped with a zoom lens and a specialized light filter. The team compared the use of the advanced imaging technology, known as near-focus narrow-band imaging, with three other endoscopic lens-and-light combinations. The narrow-band light filter on the scope makes blood vessels stand out, enabling doctors to detect the vascularization characteristic of polyps and also to distinguish recurrent polyps from irregular scar tissue that occurs after EMR. “We found that the accuracy of the new technology to be 100 percent, predicting normal scar versus polyp. It eliminates the need for a biopsy or the removal of additional tissue,” Dr. Wallace says. The study was funded in part by the Joyce E. Baker Fund for Gastrointestinal Research at Mayo Clinic’s Florida campus. Other Mayo Clinic authors include Pujan Kandel, M.D., Eelco C. Brand, M.D., Joe Pelt, M.D., Colleen T. Ball, MS, Ernest P. Bouras, M.D., Victoria Gomez, M.D., Massimo Raimondo, M.D., Timothy A. Woodward, M.D. as well as Wei-Chung Chen, M.D. of Methodist Hospital, Houston, Texas.